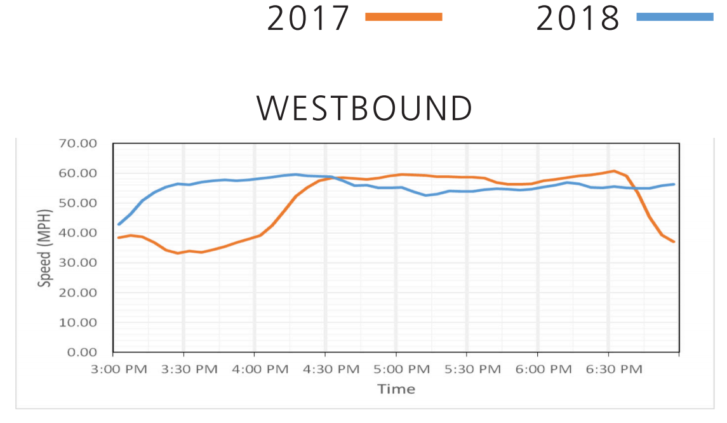 Continuing a trend that suggests the expanded hours are having a larger impact than the toll price, average travel speeds have generally increased in the extended rush hour periods when HOV restrictions did not apply before. WASHINGTON — Light summer traffic meant lower average morning tolls on Interstate 66 in July, but at the height of the afternoon rush, traffic was actually a bit slower than a year earlier. In the afternoon in July, average speeds on Interstate 66 inside the Beltway were a few miles an hour lower between 4:30 p.m. and 6:30 p.m. than they were in the same month a year earlier, a new Virginia Department of Transportation report said. In the morning, the largest speed increases in July compared to the previous year were before 7 a.m. and between about 9:15 a.m. and 9:30 a.m. In the afternoon, the most significant speed increase was between 3:30 p.m. and 4 p.m. Under the rules that began last December, weekday drivers must pay a toll to use the road eastbound between 5:30 a.m. and 9:30 a.m. and westbound between 3 p.m. and 7 p.m. unless they have an E-ZPass Flex switched to HOV mode and at least one other person in the car. A considerable number of drivers, 13.8 percent of all trips, continue to face extra fines or fees since they are using the road without an E-ZPass of any kind. That equates to more than 93,000 individual trips taken in July without an E-ZPass. Even drivers who meet HOV requirements must have an E-ZPass Flex in order to qualify for the free ride. The proportion of drivers without an E-ZPass has not significantly changed since tolls launched. Even some drivers who are aware of the tolls do not understand all the rules. One hundred forty one trips out of 678,165 taken during tolling periods in July cost $40 or more. That could include trips taken by people without an E-ZPass. Average morning tolls in July dropped from $7.82 in June to $6.81 in July, while average afternoon tolls fell from $5.21 in June to $4.13 in July. Those averages reported by VDOT include trips along only part of the corridor. Tolls rise and fall based on the amount of traffic in the lanes and choke points along the roadway like the eastbound Dulles Connector Road merge. The average toll paid over the entire eight months the tolling and expanded HOV hours have been in place is now $8.17 in the morning and $4.62 in the afternoon. In July, average speeds on Route 50, Route 29 and Route 7 were largely similar to or better than the same time last year. On the George Washington Parkway, trips took slightly longer than the previous year before 6:30 a.m. when HOV rules used to kick in on Interstate 66, but were faster the rest of the morning rush. In the afternoon, average travel times on the G.W. Parkway were mostly similar or a bit faster than the previous July, but a bit slower between 6 and 6:30 p.m.